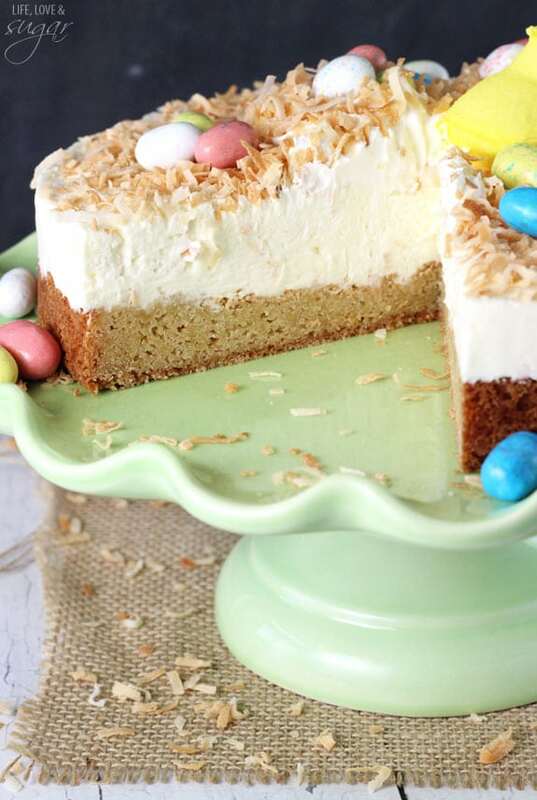 This Coconut Blondie Cheesecake is so darn good and full of coconut flavor. 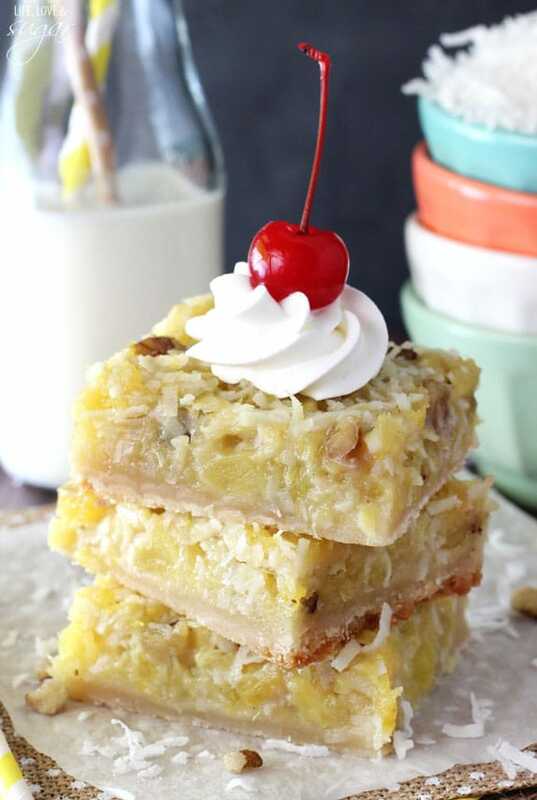 Every time I make another coconut dessert, I’m reminded of how delicious coconut is. 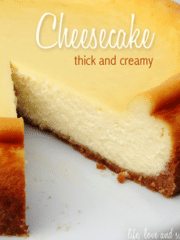 And the combination of the chewy blondie and the smooth, creamy cheesecake is to die for. So you know how whenever something’s missing, your mom is always the on who finds it. It never seems to fail. Sometimes I think I need to be a mom just so that I can actually find something for once. Last night, the hubs and I sat down to eat dinner and watch a little tv. We were going to watch something on our apple tv, but couldn’t find the little remote. We’ve never had trouble with it before. It’s always hanging out with our other two remotes. We knew we’d just seen it. But we couldn’t find it. We got up and walked around the whole living room, pulling up couch cushions, looking underneath pillows and everything we could think of. We started searching the kitchen and our offices, in case it’d made it’s way into another room. Finally we gave up and decided to watch something that’d been DVRed. We had that remote. 🙂 Then, in the middle of eating, the hubs grabs his napkin and there underneath it, in the one place we didn’t look, was the remote. It was one of those moments that we totally just laughed at ourselves. However, this cheesecake is no laughing matter. No, it’s an eating matter. One you won’t want to miss out on. 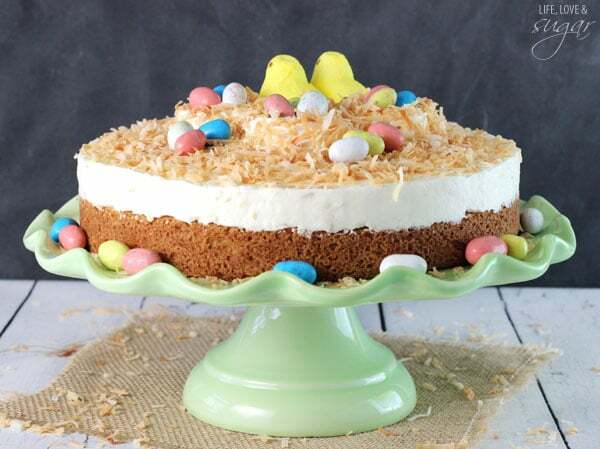 With or without the Easter decor on top, this cheesecake needs to be made. It’s so coconuty! I’m in love. Though I decided it’d be fun to deck it out for Easter, that’s entirely optional. I wanted to use some Peeps. 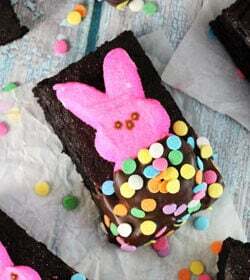 The hubs loves Peeps – he eats them frozen. And eggs, they’re so Easter-y. So I decided that Mr. and Mrs. Peep needed to get together and have some eggs. I loved how easy it was to put together using the candies. 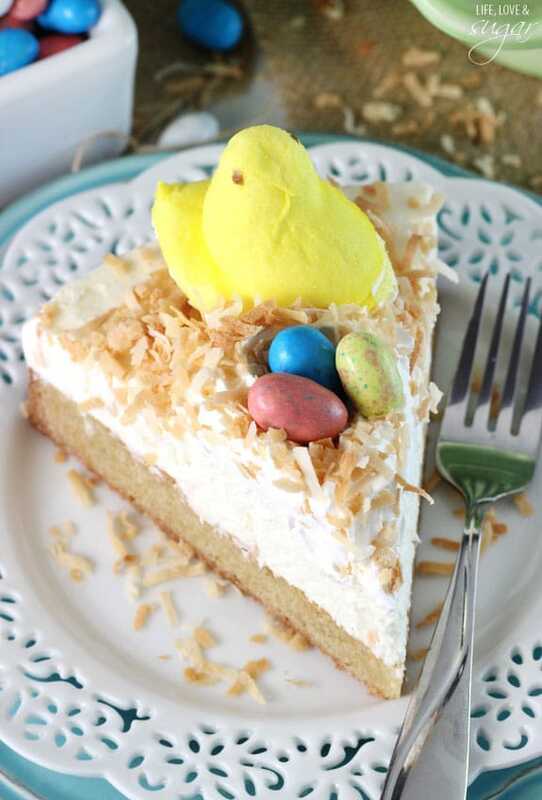 The main things you need for the top are toasted coconut, some whipped cream (I used Cool Whip), a couple Peeps and some eggs. I used malted eggs, because I love them, but you could use jelly beans or whatever egg-shaped candy you prefer. I piped the nests using the whipped cream and made three circles. 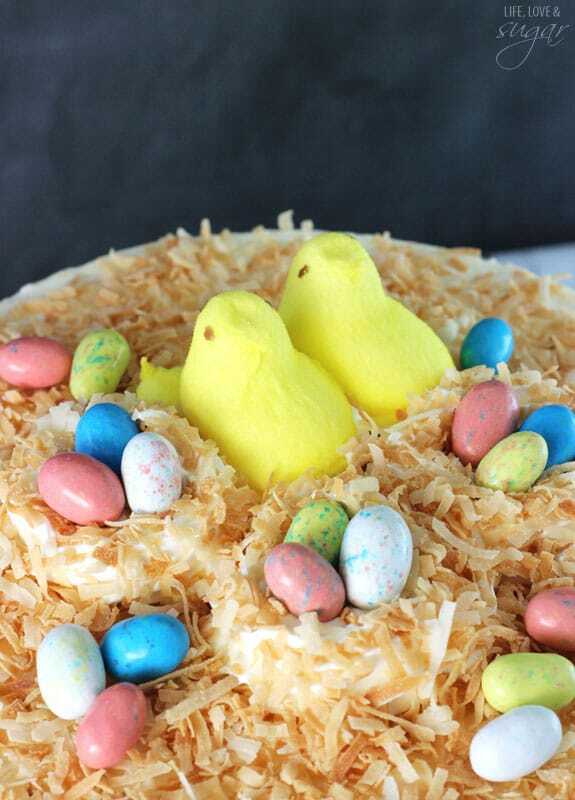 I then covered the nests and the top of the cheesecake with the toasted coconut. I left some space in the back of the three nests for Mr. and Mrs. Peep, where I added them and then added the eggs. Easy peasy! And so cute! 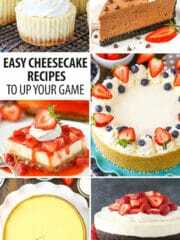 And the cheesecake itself is easy to make as well. The brownie is made and cooled, then the no bake cheesecake is added on top and allowed to firm in the refrigerator. 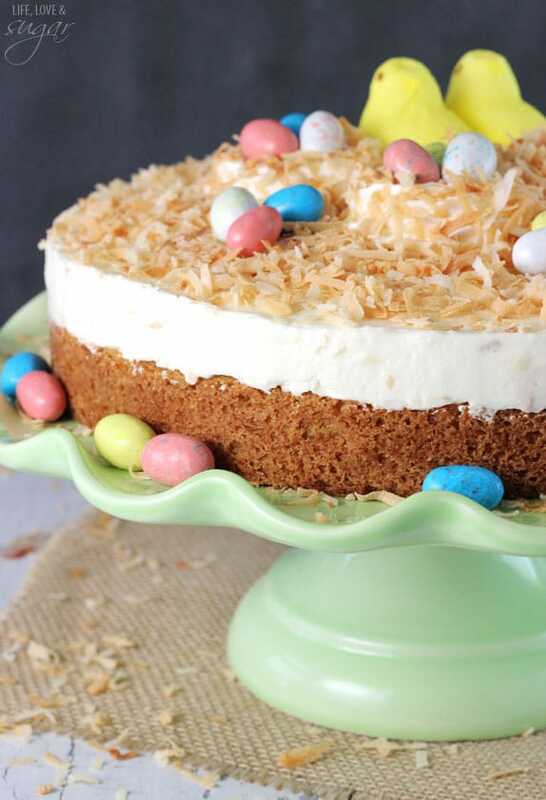 There’s coconut in both the blondie and the cheesecake, making it double the awesome. 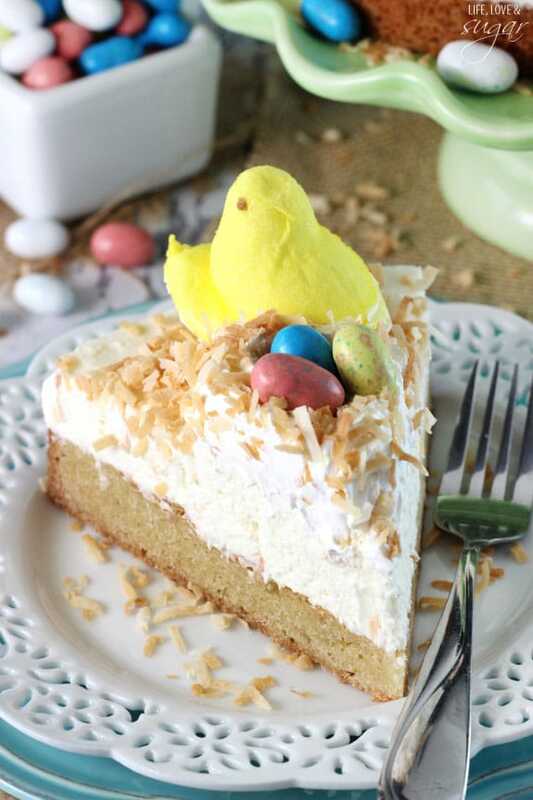 This cheesecake definitely needs to make an appearance on your table – either with Mr. and Mrs. Peep for Easter, or without them another time. You won’t regret it. 2. 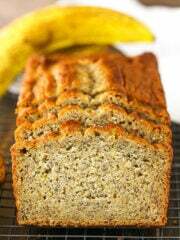 To make the blondie, melt the butter in a microwave safe bowl, then transfer to a mixing bowl. 3. Add sugar and brown sugar and whisk to combine. 4. Add the coconut extract, egg and egg white and whisk until incorporated. 6. Slowly add dry ingredients to wet ingredients and mix until combined. 9. Allow to cool for about 5 minutes, then remove from pan to finish cooling. 10. 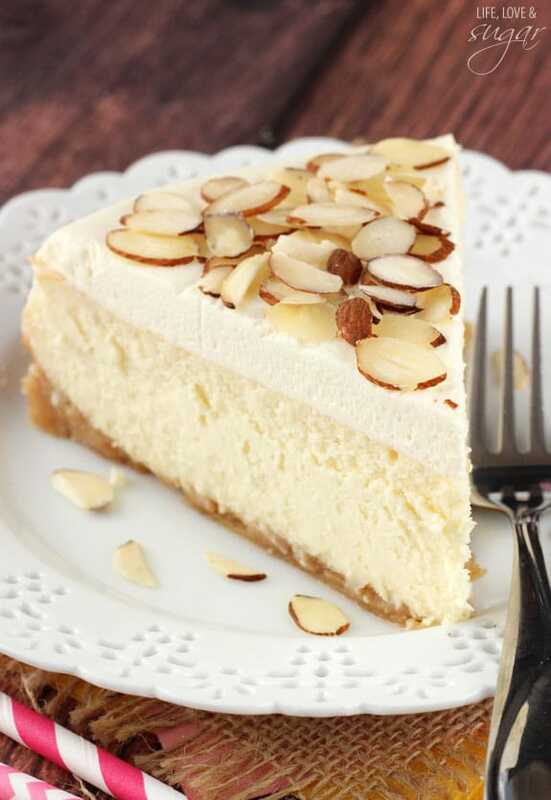 Once the blondie is cool, make the cheesecake. 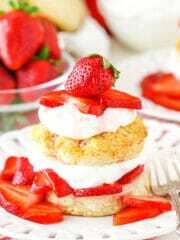 Beat cream cheese, sugar and coconut extract until smooth. 11. 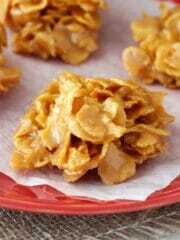 Fold in Cool Whip and 1/4 cup of toasted coconut. 12. 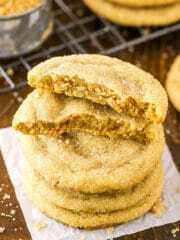 Place blondie back into the springform pan and line inside edges of pan with parchment paper. 13. Spread cheesecake evenly on top of blondie, then put in refrigerator until firm about 3-4 hours. 14. 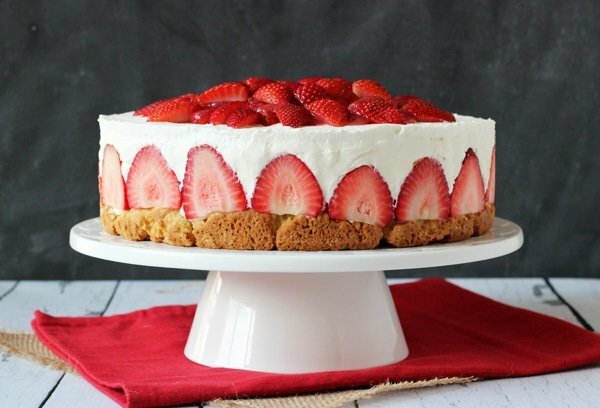 To decorate the top, remove cheesecake from springform pan and place on serving plate. 15. Pipe 3 circles as the nests with the additional Cool Whip. 16. 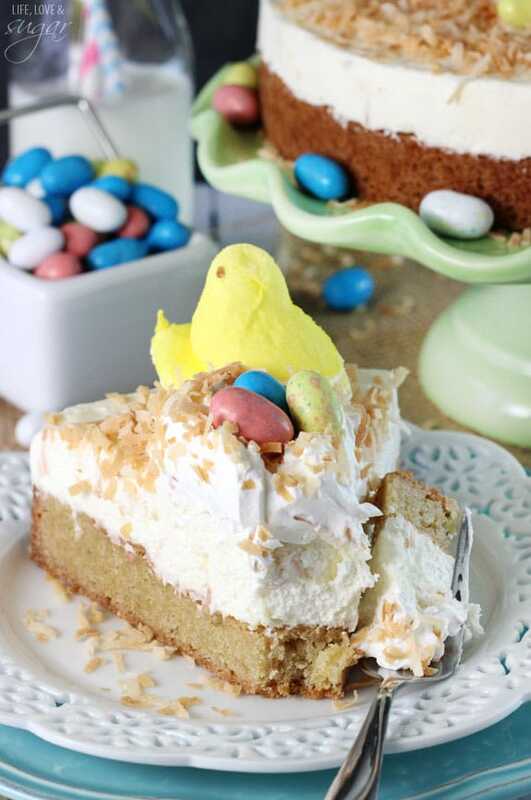 Sprinkle remaining coconut over the top of the cheesecake, including the nests. 17. Place egg candies in the nests and place two peeps by the nests. Add additional eggs around the cheesecake, if desired. Definitely adorable with the two Peeps. 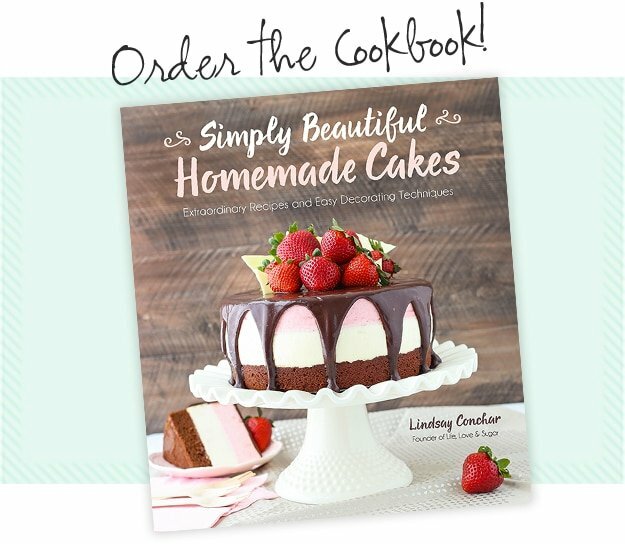 It looks like a little wedding cake, but better! Because honestly, nothing is better than cookie and cheesecake. 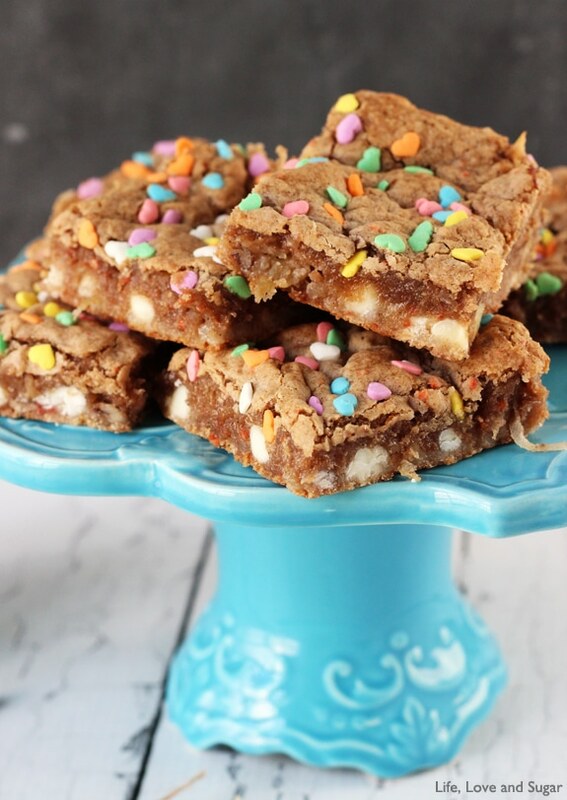 Love the idea of the blondie base + all the coconut goodness. YUM!! What a great combination! 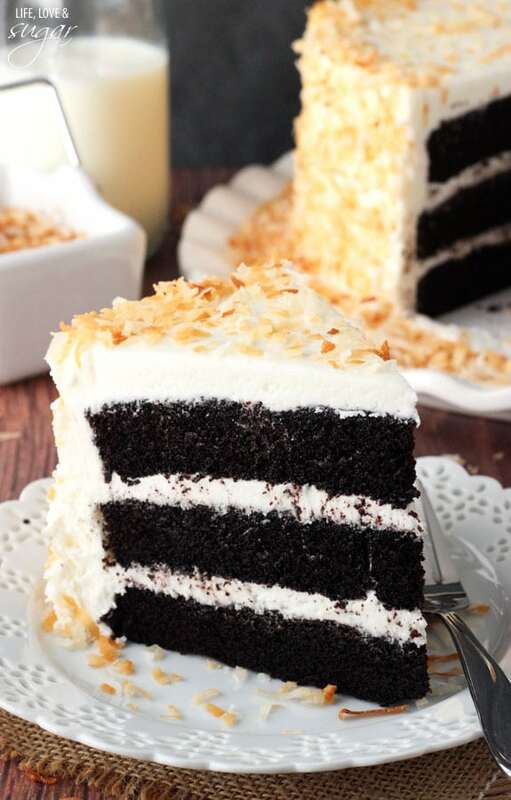 I love coconut and this looks delicious! I love the blondie bottom on this cheesecake! It sounds so good with the coconut. And the peeps on top are adorable. 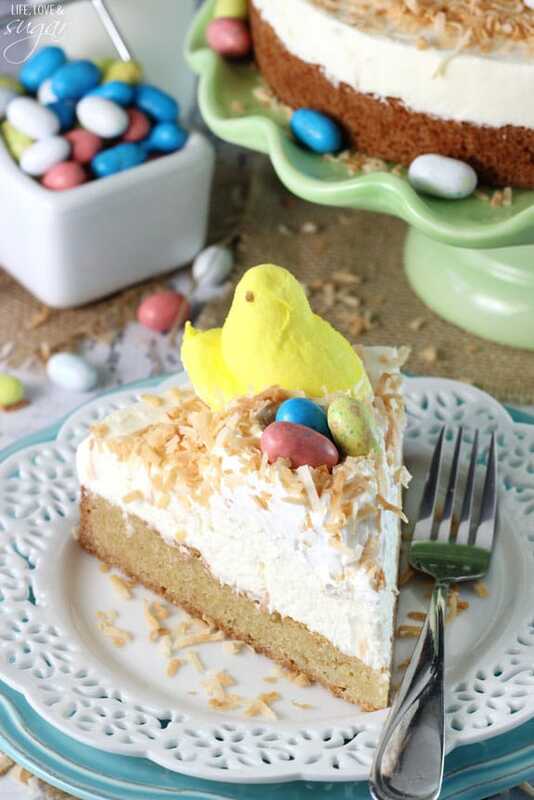 I love how this cake screams Easter/spring! Ooh blondies!!! (I still giggle like a clever 5-year-old whenever I hear or read that.) I need to tell you that I’m officially traumatized and can never look at birds with innocence EVER AGAIN. Obviously the eggs came from somewhere-how come I never thought of that? (Oh, my brain howls a cry of dismay.) 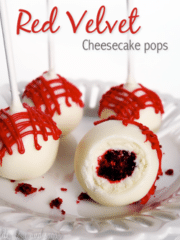 Also the word peeps-I have no clue what that is, but you can bet your….cheesecake, that I’ll never use it in any sort of conversation. 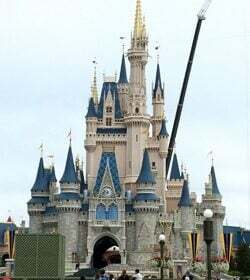 😀 Anyhow, I love you so much!!!! 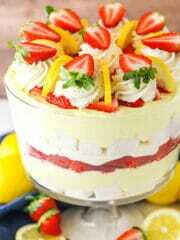 For making recipes and sharing them!!! My entire family knows you now, after all that shouting and excited yelling I do whenever you update!! 😀 Thanks so much, Lindsay, and all the best of luck to your life!!! I’m kind of shocked there’s no “Find my remote” on our iPhones, right?? 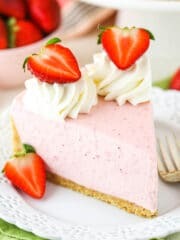 I love this cheesecake SO MUCH! I know, right?! 🙂 Thanks Dorothy! 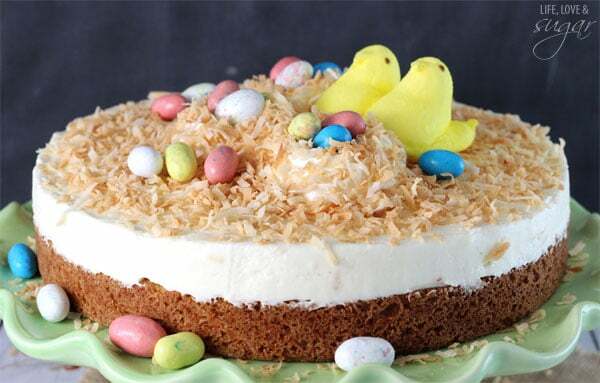 This is the sweetest Easter cake I have EVER seen! I just love it. On another note, we always loose that Apple TV remote, its so small! Thanks so much Jessica! 🙂 It is small – so easy to lose! 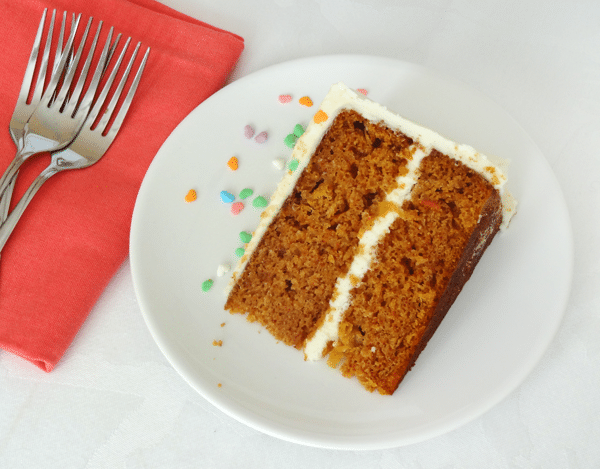 I am so glad I got to taste test this recipe! 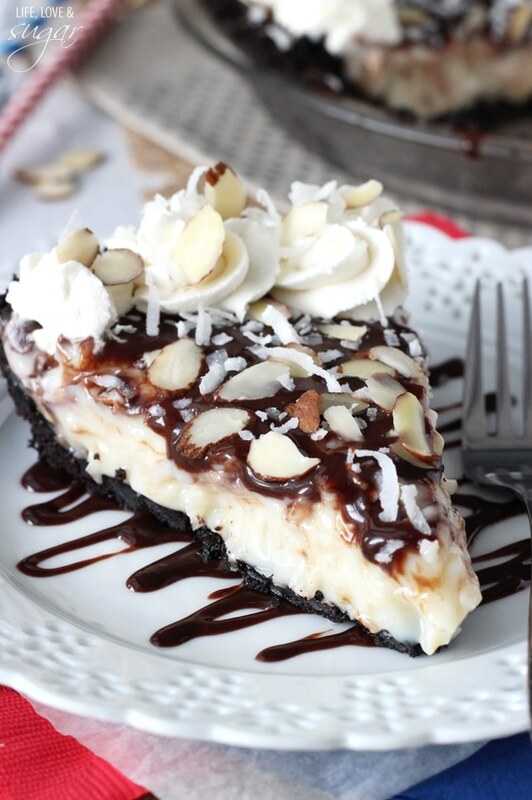 The coconut cheesecake is to die for! 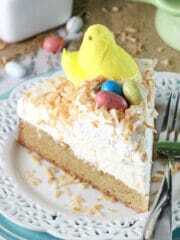 I made this for our Easter dinner dessert, to rave reviews!! My husband enjoyed the leftovers for the next 2 days and kept exclaiming over it:) This is definitely what my family calls, “a keeper”! !